When Chester Cricket is accidentally snatched up by Connecticut picnickers and taken by train into New York City, he makes a new home for himself in the Times Square subway station. There he is adopted as a pet by Mario Bellini, whose parents own a struggling newsstand in the station. 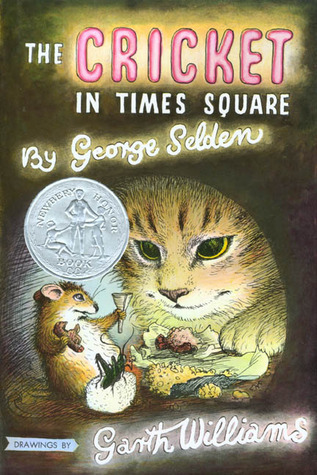 Long-time city dwellers and best friends Tucker Mouse and Harry Cat befriend Chester and soon discover a hidden talent that might be able to revive the Bellinis' failing business. I have been planning to read this book this month since I put together the monthly categories for the Old School Kidlit Reading Challenge. It was coincidental, however, that I happened to read it after having just passed through the subway station in Times Square. While I had been there before (and could probably have enjoyed the book just as well having never been there), it was fun to read about people boarding the shuttle between Times Square and Grand Central when I had just been one of its passengers myself. The setting, in fact, is one of the things I liked best about this book. It manages to capture the essence of New York City while still keeping the story confined to a small space with which young readers can quickly become familiar. The characters are also endearing. I felt similarly about them as I did about the household pets in Bunnicula, but I liked Tucker, Harry, and Chester even better. Though it does bother me sometimes when animals who are enemies in nature become friends in children's books, the story explains Tucker and Harry well enough that it isn't a problem. I also love that Chester's special talent is really just an extension of a natural ability that all crickets have. He's not so much a magical cricket, as a gifted one, and I like that approach to the fantastical elements of this story very much. I always do better with fantastical elements that grow organically out of the characters' identities, as opposed to those simply imposed by the writer for no apparent reason. This book was a quick read, and it would make an excellent read-aloud, even for a preschooler. The writing is excellent (definitely worthy of the Newbery honor the book received in 1961) and Garth Williams is the perfect illustrator to bring the characters to life. I wish I'd read this sooner, and yet I'm also glad there are several sequels so I can visit these characters a few more times!